Hatters boss Nathan Jones is remaining hopeful that full back Dan Potts will still be at the club for the start of the season. The 24-year-old caught the eye of a number of potential suitors after a stellar campaign in which he was named in both EFL and PFA Sky Bet League Two Team of the Season. Championship sides Wigan Athletic and Nottingham Forest are both rumoured to be heavily interested in the former West Ham man, who managed seven goals from 45 games, and when asked if he would still be at Kenilworth Road, Jones said: “We don’t want to lose any of our good players, we understand that there’s a lot of rumours out there, but if we listened to every rumour about our players, we’d be on tenterhooks pretty much every transfer window. “We have a process here, we developed Dan Potts, we think, significantly last year, and he’s on a continued path. “Now we hope that’s with us, but we’ll see. 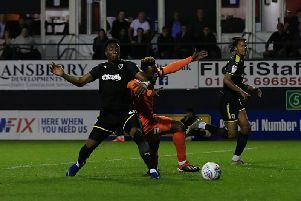 Potts isn’t the only player to alert other clubs after a scintillating season in which Town scored 94 goals to win automatic promotion from League Two. However, Jones insisted that the club’s resolve would remain strong as they look to make an impact at the next level, adding: “We have constant interest in our players, we have constant phone calls about them, they’re coveted a lot of our players. “Teams also know that we’re a very strong football club. They have enquiries, but they realise that to get a player out of Luton you have to pay our valuation and we don’t want to lose any of our players, we don’t, because we’re very proud of how we recruit and how we develop. “So a lot of interest doesn’t turn into bids because people know they could be wasting their time. “But we’ve got a lot of good players here, a lot of good players who are young, who are hungry, want to do well, a lot of players who are in good form, play the right way, are fit, athletic.